Are you ready to tap into Instagram’s booming network of 600 million viable customers? 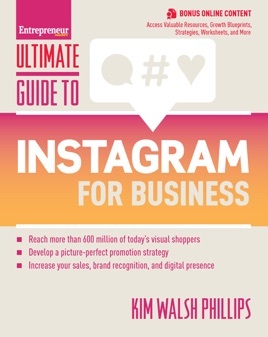 With the Ultimate Guide to Instagram for Business, social media marketing expert Kim Walsh-Phillips gives you the tools you need to get your due return on investment out of Instagram. From cross-platform branding and marketing advice to practical blueprints for funneling followers, this guide unlocks the secrets successful entrepreneurs use to drive sales directly from Instagram, become experts in their field, and grow their business. Your followers are ready to take action -- give them a reason! Whether you're new to the Instagram world or you're not sure how to get more out of your profile, this guide is the perfect tool for entrepreneurs ready to promote themselves to millions of visual shoppers. With this guide's easy-to-use strategies, easy-to-adapt blueprints, and other great resources, you'll be ready to take the plunge!